Capture his heart with the magic of this alluring Sterling Silver ring by award-winning designer Marjorie Andes. 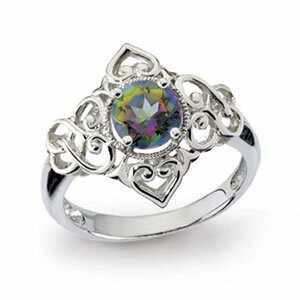 A charming Celtic love knot design rich with heart motifs frames a Mystic Fire Green Topaz blazing with flashes of passionate purple sparkle. A truly seductive and unique creation.